The setting: Juneau, Alaska. The story: a wild wolf that bonded with an entire city. Just over a decade ago a giant, wild black wolf started to prowl around the relatively contained suburb of Juneau, Alaska. When locals noticed the intimidating creature they found out something that was equal parts alarming and amazing: he wasn’t afraid of them and he seemed to be seeking companionship. Over the next 8 years the wolf, named Romeo, would go on to befriend a photographer named Nick and his story would enrapture the world. Here is Nick and Romeo’s journey over the eight years that it spanned. 34. His name was Romeo. Full grown wolves weigh in at around 100 pounds while standing at up to 63 inches in height. When Romeo first showed up on the outskirts of Juneau, the people of the city were right to be afraid. 33. Nick first found the wolf outside of his own home. In an interview with National Geographic Nick revealed that he found Romeo by following tracks out in front of his house down to the family lake. Romeo was standing on the ice. Nick got his skis on and before too long Romeo was essentially a part of the family. 32. Romeo was uncharacteristically calm and friendly. Wolves are wild animals and as such, they typically treat any visitors as potentially hostile thus being skittish and nervous. This was not the case with Romeo. Romeo was relaxed, friendly, and approachable. 31. Wolves can be terrifying animals. Despite Nick’s successful first encounter, he was right to be timid going forward with Romeo. Wolves are apex predators and they certainly would be willing to eat a dog or attack a human. However, this simply wasn’t the case. 30. Play dates became a common event for Nick and Romeo. For no reason in particular, it appeared that Romeo wanted companionship. Over the next six years, Romeo would frequently come to the lake to play with little pup Dakota while Nick took photographs from afar. 29. Romeo was almost part of the family. You can’t really domesticate a wild animal like Romeo but Nick never really needed to. For some reason Romeo allowed himself to become an extension of Nick’s family. 28. So how did Romeo get his name? While Romeo first became friends with Dakota he seemed to take a particular interest in another dog — Juliet. Juliet would frequently play with Romeo at the Mendenhall Glacier Park which was adjacent to Nick’s own home. We’re sure there is a Disney movie already brewing about this relationship. 27. Romeo was an impressively sized creature. Romeo wasn’t a cartoon character or a picture on the web, he was a full sized animal. Here we can see how large Romeo was in comparison to a fully grown dog. Had Romeo wanted to assert his dominance he could have. However, that never happened. 26. Local citizens even came to see Romeo. When most people see a wolf they tend to stay quiet and walk the other way. However, in the case of Romeo, he became something of a local hero. People would go down to the park with their pets to meet the wolf who had befriended their city. 25. Romeo and Juliet grew quite close. Nick took to calling Romeo a ‘flirt’ but it appears that Juliet wasn’t afraid to show her admiration either. This is a picture perfect moment. 24. Play dates quickly grew in size. Incredibly, Romeo was comfortable with any number of dogs that would swing by the park in order to play and fraternize. Had Romeo the slightest inclination he could have harmed anyone there, but he was always calm and always friendly. 23. Romeo even learned to ‘play’. Big old Romeo would watch how the other dogs played ‘fetch’ and he began to learn. Eventually, it got to the point that Romeo would bring branches and other toys to humans in order to ‘play’ the same games. His favorite toy was a styrofoam float. 22. Romeo was a majestic creature. While Romeo gained friends our photographer Nick would gain experience. Here is a majestic shot of Romeo out in the whirling Alaskan snow. 21. Romeo was fully grown when he first appeared. We could kind of understand a wolf growing up around humans and thus becoming comfortable but that wasn’t the case here. When Romeo first appeared he was already fully grown. We wonder what his life had been like before Juneau and Nick. 20. Dog and wolf got along spectacularly. In just about any other situation Romeo would have been shot by the first guy with a gun that saw him. Instead, Romeo grew to befriend the people and dogs of Juneau. Here we see dog and wolf at play. 19. He was even comfortable enough to nap! Wolves are notoriously skittish creature. Here we see Romeo completely denying conventional wisdom by relaxing and even napping around other animals and humans. Incredible! 18. Romeo would live a long life. The average lifespan of a wild wolf is roughly three years — about how old Romeo was when he first showed up in Juneau. Romeo would go on to exceed that lifespan by living to be nearly 7 years old. The odds of a dog, wolf, and a human all getting along together is just hard to fathom. We almost can’t complete that this is real. 16. Romeo learned many ways to play. 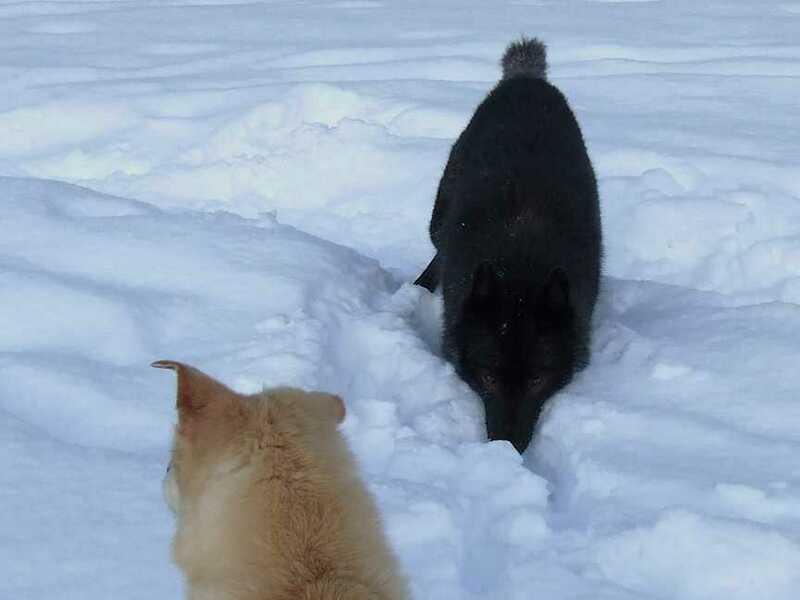 Wolves will certainly play with each other in the wild, but seeing Romeo adjust his strength in order to play with these domesticated dogs was truly mind-blowing. 15. He loved to dig. Like a hyper little dog seeing snow for the first time, Romeo loved to dig. Romeo truly became entrenched in the local scene as a friend to both dog and man. Romeo quickly began to adopt many mannerisms that the other dogs had displayed. Here we see Romeo in his traditional play pose: ready for fetch! 13. Good things don’t last forever. After six long years of hanging around, a sudden absence from Romeo put the whole community on edge. Where was he? 12. Romeo had been killed for sport by hunters. Nick and the rest of the community were gutted when they had found out what had happened to Romeo. He had been killed by hunters who had been out shooting for sport. Wolves are hunted around the world, but the loss of Romeo had made it personal. 11. The community missed their friend. Losing Romeo had felt like a punch in the stomach. In order to remember their wild, furry friend the people of Juneau decided to hold a Memorial. 10. A plaque was commissioned. The community had R.T. Wallen, a local artist, create a plaque for Romeo. It was placed by Mendenhall Glacier which was one of Romeo’s favorite places to play. To this date, since it was placed in 2010, friends of Romeo will visit the plaque to remember him. 9. A view of the glacier with Romeo. Here we see Romeo playing in front of the Mendenhall Glacier, just a few feet away from where his plaque now sits. Locals who visit the Glacier can still remember the way their gigantic friend would romp across the ice as if he too were just one of the dogs. 8. Nick would write a second book. Nick was so touched by his relationship with Romeo that he had to put his thoughts into words and pictures. Nick would release book in 2014, A Wolf Called Romeo. This was a more detailed story about how Romeo had impacted all of Juneau. The book includes stories from other individuals who had called Romeo a friend. 7. Romeo really had been part of the family. It’s easy to look at the death of a wolf and shrug our shoulders because, after all, he was just a wild animal. To the people of Juneau, and Romeo himself, the feelings are different. Romeo truly felt like he was part of the family. 6. For a long time, Nick was furious at the hunters who killed Romeo. Nick was saddened and angered by the hunters who had senselessly killed his friend. For a long time Nick held on to that pain but he eventually let it go. Nick stated that holding on to his anger “won’t do anybody any good”. 5. Nick starts the Black Wolf Special Funding Project. The passing of Romeo gave Nick the motivation to take steps toward helping other wild wolves. Janis established the Black Wolf Committee which would then launch the Black Wolf Special Funding Project. 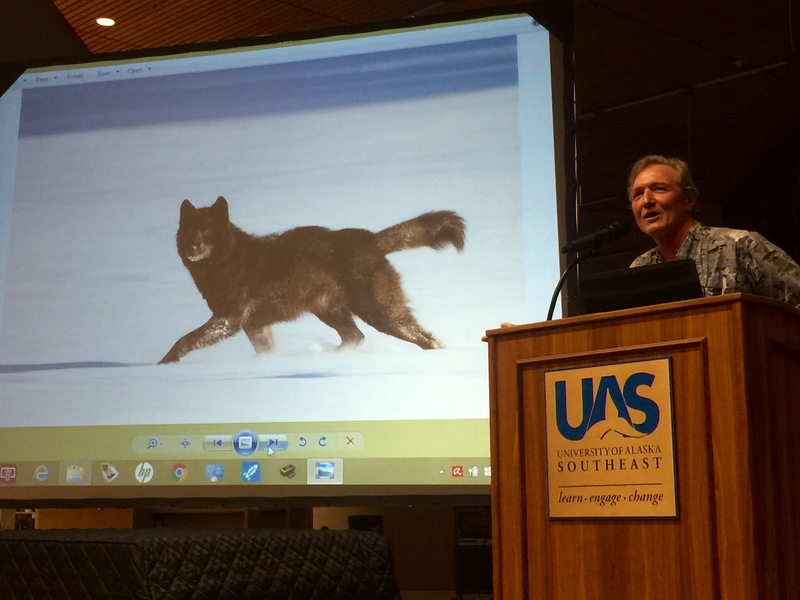 His goal with this group is to help fund research to understand and protect wolves. 4. Rome serves as an icon for the research into wolves. Romeo was far from ‘just another wild wolf’ and as such it makes sense that Nick is so entranced with researching the species. Romeo defied all natural behavioral laws in order to befriend an entire community, and there is something important to learn there. 3. The man who shot Romeo was sentenced for hunting violations. While nothing could bring Romeo back to life, the man who had shot Romeo was sentenced in court for hunting violations. The hunter had used a rifle too small of a caliber which apparently violated the law in Alaska. He was also prosecuted for several other hunting-related crimes. 2. Romeo has been memorialized all over Juneau. Juneau has already made a point to memorialize their lost friend. There is a craft beer that is named after Romeo as well as a pair of streets that were also dedicated to him. 1. Romeo may be gone but he’ll never be forgotten. Romeo could have become just another wolf in the wild but he instead became an extension of Juneau. Juneau is commonly called the ‘last frontier’ of Alaska and Romeo’s appearance helped to sort of blend both man and wild.